Well the condensation control has improved. Running the heater more frequently and opening the windows meant we didn’t “steam up” and we were getting around in short sleeves. I was almost tempted to get into shorts but I didn’t want the hassle of fighting off all the girls! 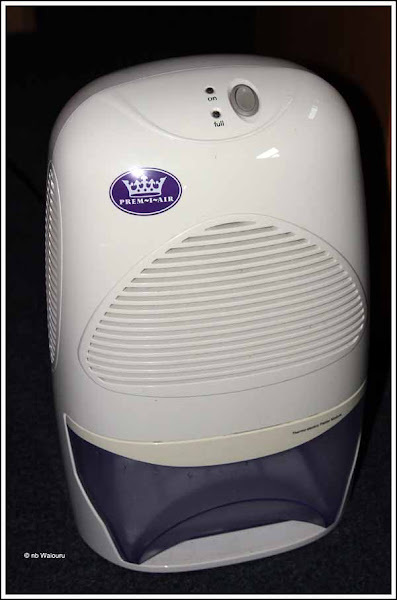 Late in the afternoon Julie (nb Greyfisher) appeared with her second (spare) dehumidifier and offered to lend it to us for a trial. It’s quite small and operates on 12v DC through a 240v transformer. Julie purchased it from Coopers of Stortford and I looked up their website to see if there were any in stock and the price. They cost £29.99 and after more online searching this appears to be the standard cost. Last night we made up the bed but this time we didn’t tuck the duvet under the end. We ran the humidifier whilst we slept. This morning the foot of the duvet was dry and there was approximately 100 mils of water in the dehumidifier. We also noticed there was no condensation on the windows. We’ll run another couple of trials before decided whether to purchase one for ourselves. If we buy one then I will run it directly from the 12v supply on the boat. It’s rather inefficient to convert 12v to 230v only to convert it back to 12v for the dehumidifier. 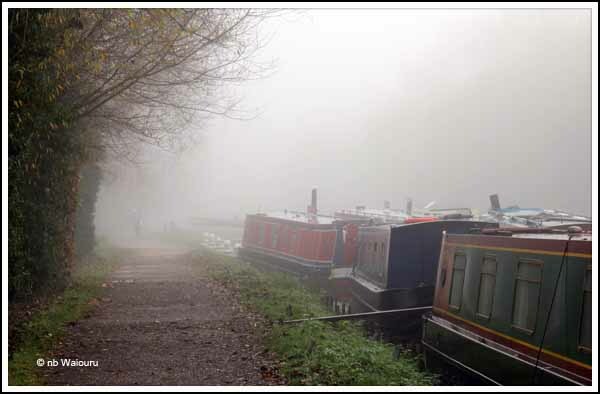 This morning it was very misty. 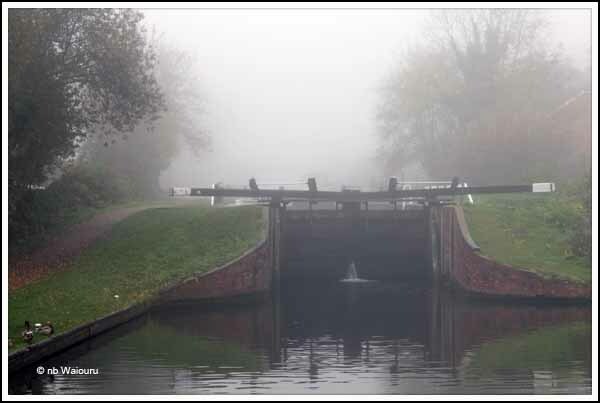 The moorings above Aldermaston Lock were also lost in the mist. Even the BW Facilities Block looked cold. nb Meand’er is now moored ahead of us. 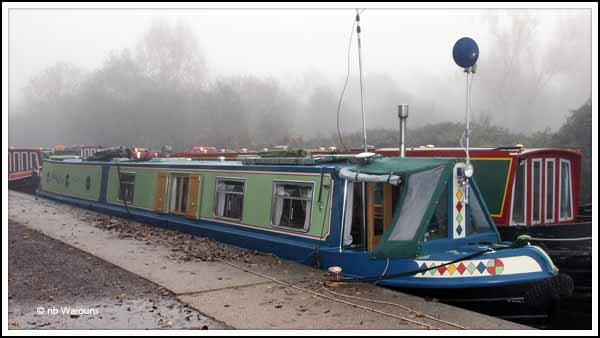 Kevin & Sue are here for the winter and I’m already impressed with some of the interesting features on their boat. Kevin has an interesting setup on the rear of Meand’er which enables him to store the anchor and fenders out of the way. He also has a retracting hose behind a cap on the back of the boat. The hose has a nozzle and dispenses hot water. It’s ideal for filling a bucket to wash the boat, footwear, hands, etc rather than carry a bucket of water through the boat. It’s rather obvious we have been handicapped by living in Australia whilst attempting to design the layout in isolation. 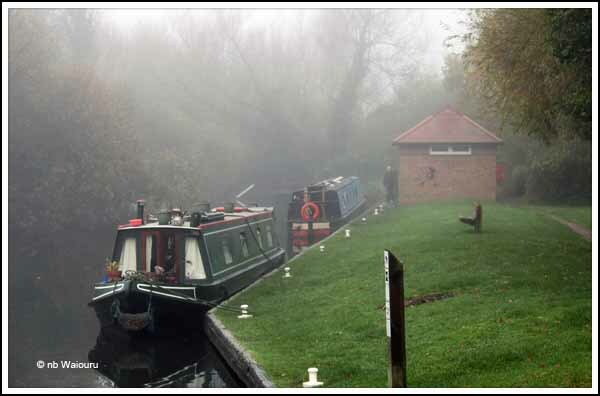 Spending a week on a hire boat doesn’t really give you a serious impression of what can be achieved. We are on a rapid learning experience and I’ve already added a few more things to Waiouru’s specifications. It's going to take some time to get the water levels down on the boat. More heat and more ventilation is the key. We have so much of both we never get condensation on any of the windows never mind the timber. The bed board on yesterdays post also needs loads more holes in it or slats fitted otherwise your mattress will be a black, moldy stinking mess in a year. Key here, if you have condensation on your windows in the morning, there isn't enough ventilation. Others may disagree but we wear shorts and tee shirts all the time on-board and never ever have any condensation. Any fool can be cold and wet.